Reference number for this case: End-Sep-54-Auge. Thank you for including this reference number in any correspondence with me regarding this case. - In the Pyrenees-Orientales, a truck driver, who was collecting milk in the vicinity of Cabestany, saw in front of his vehicle a "bluish globe", bluish-colored "which evolved at an altitude of about 15 meters, Producing a very soft hum ". Having stopped his truck, the driver was able to observe the evolutions of the craft for almost a quarter of an hour, then suddenly it would have risen in the sky and disappeared in direction of the sea. - In the Deux-Sèvres, a "sparkling yellow disk" was observed at Auge, in Sainte-Pozenne and in Fontenay-le-Comte. - In Finistère, the inhabitants of Landeda and the Aber-wrac saw, at high altitude, a machine of circular shape "resembling a saucer". - Near Montpellier, Mrs Picot de La Baume stated that at an altitude of about 1,500 meters she saw a cigar-shaped device, shiny, which seemed to be surrounded by a halo. The machine, which she could observe for a minute or so, suddenly disappeared in an easterly direction, without making a sound or leaving a trace. - Near Melun, several inhabitants of the commune of Rebais saw a strange machine, very bright, circulating at night fell in the sky. They pointed out that the apparatus which circulated very slowly had then turned towards Coulommiers, having increased its speed, and had disappeared. C.R.S. also saw a luminous disc in the sky, above Vaudoy. - In Morocco, credible witnesses saw in the sky of Kourigra, about 130 kilometers from Casablanca, a machine of circular shape, red in color, evolving at a high altitude and at a high speed, and which seemed to spit out Flames of a blue-green color. Near Safi, on the other hand, the device had the shape of a cigar, moved at high speed, was surrounded by a bluish light and left behind a luminous trail. Finally, the "flying saucers" reported regularly for some time in Austria, according to the "Bild Telegraf" in Vienna, are guided missiles used to drop anti-communist leaflets over Czechoslovakia. The newspaper reported that leaflets written in the Czech language were found near Efferding in Upper Austria (Soviet zone), after the passage of two "luminous discs", the changes of which were observed by two gendarmes of a locality neighbor. These leaflets, circulated by a group of emigrants belonging to the "Czechoslovak Opposition" movement, invite the peasants of Czechoslovakia to leave agricultural collectivities and state cooperatives. Two other dailies also mention the testimony of several peasants who claim to have seen a "saucer" caught in the beam of a Soviet D.C.A. searchlight. For a few days, testimonies of people claiming to have seen mysterious luminous objects in the sky have arrived from all the corners of France. A flying saucer is said to have been seen in Auge (the Deux-Sevres). Paris, September 30. -- The appearances of more and more numerous "flying saucers", these last days, continue in France. From several places of the territory, today, the passage of these machines was reported. In Perpignan, a truck driver who carried out yesterday morning the milk collection in the surroundings of Cabestany (Eastern Pyrenees) stated to have seen in front of his vehicle "a shining globe", of bluish color, " which moved at an altitude of approximately 150 meters while producing a very soft buzzing sound". Having stopped his truck, the driver managed to observe the maneuvers of the craft during nearly a quarter of an hour then, suddenly, the latter reportedly rose in the sky and disappeared in the direction of the sea. La Rochelle, Sept. 30. -- A flying saucer was reportedly seen in Auge (Deux-Sèvres). In addition, Mr. Picaud, director of a brewery in Sainte-Pozenne stated to have seen during a few minutes, while he circulated on the road of Fontenay-le-Comte a weird disc of a shining yellow. Brest, Sept. 30. -- The residents of Landeda and Aberwrac'h (Finistère) saw yesterday evening at high altitude a machine of circular shape resembling a "flying saucer". Melun, Sept. 30. -- Several residents of the commune of Rebais stated they saw a strange craft, very shining, circulating at the night fall in the sky, above Rebais. The witnesses specified that the apparatus, which circulated very gently, had then moved towards Coulommiers, after having increased its speed, and had disappeared. The day before yesterday morning, CRS [Security Police], also saw a luminous disc in the sky, above Vaudoy. Montpellier, Sept. 30. -- Mrs Picot de la Baume, domiciled in Montpellier, stated she saw, at an altitude of approximately 1.500 meters, an apparatus in the shape of a cigar, shining and which appeared surrounded by a halation. The machine, which she managed to observe for one minute approximately, disappeared all of a sudden in direction of the east, without making noise and leaving no trace. Casablanca, Sept. 30. -- Witnesses worthy of faith saw yesterday evening, in the sky of Kourigra at approximately 130 kilometers of Casablanca, a machine of circular shape, of red color, moving at a high altitude and high speed and which seemed to spit flames of a green blue [as a meteor would do]. Copenhagen, Sept. 30. -- Many residents of the town of Strib (Fionia) stated yesterday evening to have seen "a yellow-reddish machine" whose shape reminded of a cigar "moving at high altitude and leaving behind "tongues of fire" [like a meteor]. Other "luminous machines" were seen these last three evenings in Fionia and Sweden. Vienna, Sept. 30. -- "Flying saucers" reported regularly for some time in Austria, would be according to the "Bild Telegraf" guided missiles used by certain powers to release anticommunists leaflets above Czechoslovakia. This newspaper indeed reports that leaflets written in Czech language were found close to Eferding, in High Austria (Soviet zone) after the passage of two "luminous discs" whose maneuvers were observed by two police officers of a nearby locality. These leaflets, spread by a group of emigrants belonging to the "Czechoslovakian Opposition" movement invite the peasants of Czechoslovakia to leave the agricultural communities and the State co-operatives. Two other daily newspapers also mention the testimony of several peasants who claim to have seen a "saucer" taken in the beam of an a Soviet anti-aircraft projector. Perpignan, September 30. -- A truck driver who carried out the collecting of milk yesterday morning around Cabesty (the Pyrenees Orientales) stated to have seen, in front of his vehicle, a "shining sphere" of "bluish" color which moved at an altitude of approximately 150 meters while producing a "very soft buzzing sound". Having stopped his truck, the driver managed to observe the evolutions of the machine during nearly a quarter of hour, then suddenly, it rose in the sky and allegedly disappeared in direction of the sea. A flying saucer was reportedly seen in Auge (Deux Sèvres). In addition Mr. Picaud directing a Sainte Pezenne brewery stated to have seen as he drove on the road of Fontenay-le-Comte, a curious disc of a sparkling yellow color. The residents of Landeda and Aberwrac'h (the Finistère) saw yesterday evening at high altitude, a machine of circular form resembling a flying saucer. Several residents of the commune of Rebais stated to have seen a strange machine, very shining, circulating after the fall of night, in the sky, above Rebais. The witnesses specified that the apparatus which circulated very gently, had then moved towards Coulommiers, after having increased its speed, and it disappeared. The morning of the day before yesterday, CRS [police corps] also saw a luminous disc in the sky above Vaudroy. Mrs. Picot, of la Baume, domiciled in Montpellier, stated to have seen, at an altitude of approximately 1500 meters, an apparatus in the shape of a cigar, shining and which appeared surrounded by a halation. The machine, which she managed to observe one minute approximately, disappeared suddenly in the direction of the east, without making noise nor leaving traces. Witnesses worthy of faith saw yesterday evening, in the sky of Kouriga, locality at approximately 130 km of Casablanca, a machine of circular form at a high altitude and a high speed and which seemed to spit blue-green flames. A machine of lengthened form was seen yesterday evening, towards 08:30 p.m., in the sky of Safi, by witnesses worthy of faith. The "cigar" moved at a high speed, from the East to the North-West. It was surrounded by a bluish light and left a luminous trail behind. The witnesses claimed that this machine had no relationship with a jet plane. Numerous residents of the town of Strib (Fionia) claimed yesterday evening to have seen "a reddish yellow machine whose form recalled a cigar moving at very high altitude and leaving tongues of fire behind". Other "luminous machines" were seen these last three evenings in Fionia and Sweden. Luc Chastan indicates that in the Deux Sevres in Augé on September 29, 1954 at an unknown hour, there was an "Observation of an object without more precision." The source is indicated as "Le Dauphiné Libéré". The website indicates that on 28 September 1954, in France, in "Deux-Sèvres", "Sightings from various sites." "An unidentified object was sighted, but with appearance and behavior that most likely would have a conventional explanation. One object was observed." The sources are listed as Michel, Aime, Flying Saucers and the Straight-Line Mystery, S. G. Phillips, New York, 1958; Vallee, Jacques, Computerized Catalog (N = 3073); Vallee, Jacques, Anatomy of a Phenomenon, Henry Regnery, Chicago, 1965. [er1] Article in the regional newspaper L'Est Républicain, France, October 1, 1954. 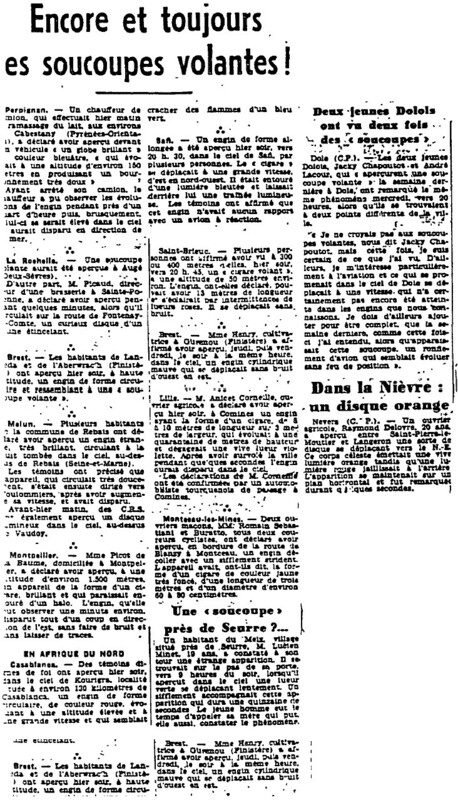 [lm1] Article in the regional newspaper Le Méridional, France, October 1, 1954. [la1] Article in the regional newspaper L'Alsace, Mulhouse, France, October 1, 1954. 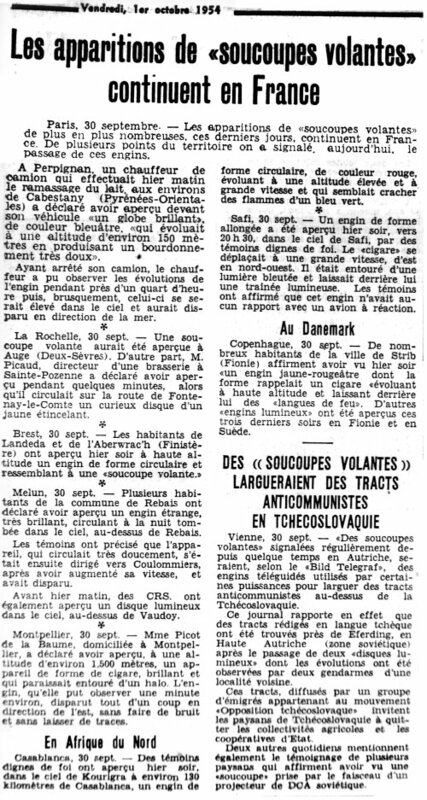 [vm1] Article in the regional newspaper Var-Matin - République, Toulon, France, October 1, 1954. 0.1 Patrick Gross July 12, 2007 First published. 1.1 Patrick Gross May 28, 2010 Addition [la1]. 1.2 Patrick Gross July 7, 2010 Addition [ud1]. 1.3 Patrick Gross July 26, 2010 Addition [vm1]. 1.4 Patrick Gross December 22, 2016 Addition [pr1]. 1.5 Patrick Gross January 20, 2017 Addition [er1]. This page was last updated on January 20, 2017.